Good Reads Summary: In the zombie-infested, post-apocalyptic America where Benny Imura lives, every teenager must find a job by the time they turn fifteen or get their rations cut in half. Benny doesn’t want to apprentice as a zombie hunter with his boring older brother Tom, but he has no choice. He expects a tedious job whacking zoms for cash, but what he gets is a vocation that will teach him what it means to be human. Before I say anything about this AWESOME book, let’s chat about the cover. It’s one of those covers that has sort of followed me around every book store I’ve gone into, whispering “read me”. It’s a creepy cover, but for some reason, you just can’t look away. I don’t know if it’s because I haven’t read many of them, but I’m really enjoying the post-apocalyptic books I’ve read this year; this, Angelfall, and Blood Red Road (probably my favorite read of the year) were fantastic. The great thing about Rot and Ruin is it’s complexity. It’s a coming-of-age story, with action, romance, horror, and mystery all thrown together. The protagonist, Benny Imura, is such a punk when this book begins. I wanted someone to slap him and tell him to get his act together. It was such a great set-up for his character growth. His transformation was the best part of this story. He’s 15, and thinks his zombie-slaying brother Tom is lame. Why anyone would think Tom Imura is lame is completely beyond me. In many ways I’m glad that the story wasn’t from his point of view because you would miss the great journey of self-discovery that Benny goes through. Tom is pretty much a static character. But dang, he’s amazing. I was continually reminded of characters like Aragorn from The Lord of the Rings whenever Tom did anything. He knew he had a terrible job to do, and even though you knew he didn’t want to do it, he knew someone had to and he did it anyway. Plus, he’s handsome, noble, intelligent, wields a katana, and seems to know everything about everything (in a completely attractive, non-annoying way). And he wasn’t even involved in the main romance of the book. Funny how that works. 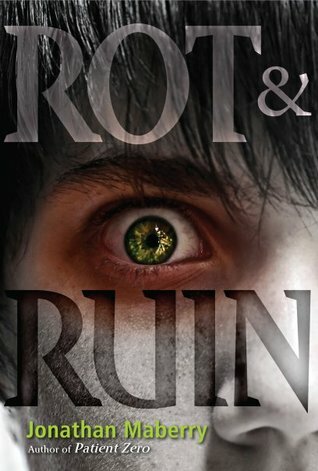 The antagonists in Rot and Ruin were EVIL. And they weren’t zombies. They made me cringe. Humorously enough, the zombies never made me cringe as much as the antagonists did. Much of this book was spent in action; maybe that’s what is so great about Post-Apocalyptic books; it’s always about someone running around in the middle of a wasteland (or, in this case, deserted countryside populated by zombies), and they are always fighting someone off or chasing someone. There is very little down-time. The entire second half of the book is a whirlwind. And the romance that was mixed in was sweet and honest, adding a nice layer to the plot rather than overpowering it. The cast of secondary characters was splendid. I loved getting to know Nix, Benny’s lady love, who is fiery and brilliant, and sadly becomes quite hardened by the end of the book. The mysterious Lost Girl was entertaining, and at times terrifying. But really, the joy of this book was seeing Tom and Benny’s relationship develop. Tom so obviously cares deeply about his little idiot of a brother, and Benny is, well, an idiot. Their road to true brotherhood is rough and trying, but a magnificent journey nonetheless. Highly recommended for fans of zombies or the post apocalyptic genre. This entry was posted in Book Reviews, YA and tagged Post Apocalyptic, YA. Who or what is the antagonist?